New Orleans Office Furniture – Oldie But Goodie? What kind of vibe do you want your office to give off? If you have a New Orleans office, furniture that fits with the glory days of the town might be in order. Executive office desks made of heavy wood and stained rich colors still have a place amidst modern styles that favor lightweight wood board, plenty of metal, and black or chrome highlights. 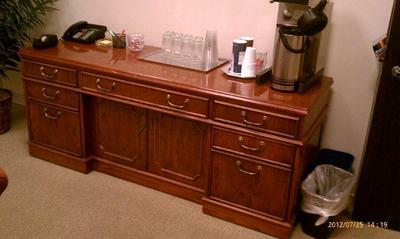 The credenza pictured opposite is another type of furniture that could give your office a warm and luxurious fee. While many office spaces resort to cookie cutter pieces when looking for supplemental furniture, The Office Planning Group seeks to bring inspiration to every corner of the office with fine pieces that feature character. Using this credenza as a kind of reception concierge space allows you to offer guests refreshment as well as a place to make a call or take a note as needed. For an even fancier feel, real glassware and mugs could be provided instead of plastic and foam cups. A mini-fridge with custom labeled bottles of water is also a nice touch. You should also pay attention to how each piece fits in with existing decor. This credenza is placed in an office in which the existing desks and chairs have the same style and wood stain, providing a balanced and even look to clients. Executive desks can be placed against walls or in an L or U arrangement or even back to back if space is tight, allowing room for multiple people to use the same workspace – thanks to the opulence of days gone past, a large wooden desk is likely to be large enough that there will be plenty of room for everyone. Think outside the box when it comes to decorating your New Orleans office. Don’t jump in with the slickest (or the cheapest) option you ca find with bland, boring pieces that would be interchangeable with a dozen other offices in the vicinity, Your office furniture is a major part of your first impression, so think about investing in real, old style wood pieces that will stand the test of time and changing fashion. We are proud to be of service to the people in our beautiful and unique state of Louisiana! 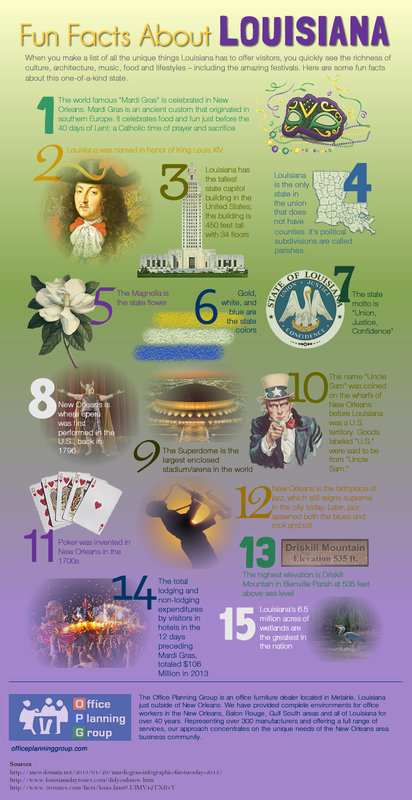 It’s been over 40 years now that we’ve been providing complete office environments for New Orleans, Baton Rouge, and all the rest of Louisiana so we thought it’d be fun to share some interesting facts about our charming state. How much do you know about Louisiana? Time to put your state trivia to the test! Mobile computer desks could be the perfect solution for your New Orleans office. Furniture that is readily movable is ideal for today’s flexible workplace environment, allowing workers to configure and reconfigure the space they are working in as teams are formed and dissolved and projects expand and contract. Mobility. Movable computer desks mean that changing the layout of your office space only takes a few minutes. High quality wheel casters permit movable computer desks to be shifted as needed, allowing the workplace to evolve over time without too much heavy lifting. Flexibility. A mobile computer desk for each employee can be a great way to manage the need for temporary teams – simple shift desk into a “pod” for the time period during which the team needs to collaborate, and then allow desks to be separated again when the need for close quarters is over. Space-efficiency. Moveable desks allow work spaces not in use to be literally shoved into a closet, freeing up extra square footage for other uses, such as project display boards or a larger table for laying out papers or blueprints on. Mobile desks also have the advantage of not being as personal, permitting several people to use the same workstation without such a sense of propitiatory ownership. For offices with flex schedules when people work different shifts or telecommuters who only need to pop in once and a while and grab some workspace while they are there, the mobile work station can simplify things. Movable desks don’t have to have wheels. Many desk components can be purchased in pieces which can be put together in a variety of configurations, and the individual components are not too heavy to move easily. A pair of corner desks can be turned into a large U or T, while four can create a square “round” table or a large I. These configurations can be helpful in offices where people need to work together and space is at a premium. As needed, components can be split off and removed to far corners of the room, creating private spaces where phone calls and other business can be carried out in relative privacy. Look into New Orleans Office Furniture that allows flexibility and discover who a transient layout could improve your efficiency. Fit in small office. The corner desk is compact and as the name indicates can be it neatly into a corner if needed. The design is focused on maximum efficiency, and “compact” in this case does NOT mean “small”. Use space wisely. The corner desk may be a fave of telecommuters, but small business offices are starting to use them more and more as a viable option. They utilize floor space in a way that leaves plenty of room for other furniture and items, and can be embellished with high cabinets on each facing wall to offer even more room for files. Multi purpose. The integrated storage that most corner desks offer is in the form of shelves or counters under and / or over the desk. Being able to keep extra reams of paper, an in and out box, ink cartridges for the fax / printer and so on at your fingertips is a great reason to invest in a heavy duty corner desk. Distraction free. If a corner desk is situated in a corner, it naturally puts the user’s back to the room, providing a veritable cone of privacy. Most workers find they are more productive when facing a wall or corner since this allows them to shut out the comings, goings, and conversations of those behind them. Versatile. Corner desks can be used in a variety of configurations. They can be put together to form a large U shape to create a decent arrangement for a conference room, or can be butted against each other to form a T and used by four or more team members. If you are looking for a New Orleans office furniture item that is practical, affordable and flexible, the corner desk might be your best option. Last week we looked at why companies think open office spaces are better than cubicles and why they might be wrong. How does open office space affect workers who need peace and quiet for their thought process? The close proximity can really hamper those who are constantly on the phone or deep in complex calculations or coding. If a worker has to leave an open-plan area to go and find a private, quite space to work on another floor, they often just stay and grit their teeth. There’s simply way too much distraction and too much noise. It’s a blend of poor sight-lines that allow on teams’ rambunctious gesticulation to distract another team 200 feet away. The goal is really to provide acoustical buffered products that can be stationed in strategic areas to provide a quiet workspace for those who need it when they need it. Creating “zones” or ” neighborhoods” can help – with one area for collaborative teamwork and another for more detailed desktop or phone applications. This could mean a blending of the open floor plan which basically means sitting everyone at tables in the open, and the cubicle based option that was designed for minimum worker interference. Hoteling units can particularly benefit from this kind of set up, as workers who need to collaborate can seat themselves together and those who are working solo can find a quiet corner to do their own work. Don’t forget the need for proper power and internet connections. Electricity is a higher priority since most computers, laptops, tablets and phones can connect wirelessly, but but you probably want at least a few direct ports. Consider adjusting your viewpoint from “either-or” when it comes to considering cubicles or an open plan in your office design, and consider the end users instead of the aesthetics. Finally, remember that the closed office is still the preferred workspace for many – so consider building a few into your floor plan. They can often be used as leverage in salary negotiations – the perk of a private office with a door that closes mist be the incentive needed for a much wanted recruit to jump ship and join your team!